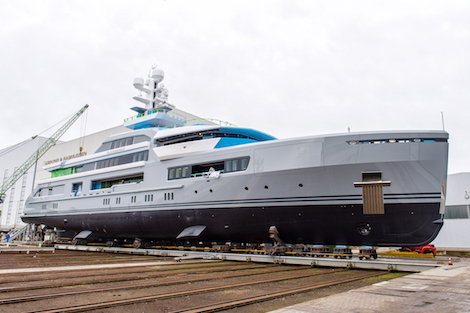 Abeking & Rasmussen has announced that the 72.5m superyacht Cloudbreak is 'now fully prepared and awaiting launch', at the time of writing. According to the German shipyard, Cloudbreak has been in development for more than four years. Named after the famed Figan surf spot, the yacht will now be prepared for her harbour and sea trials. The initial purchase of the vessel was secured by SuperYachtsMonaco, which has also managed the project through its construction on behalf of the owner. The design of Cloudbreak certainly reiterates the powerful style of Espen Øino through a number of design cues which have previously featured on Ester III, one of Øino’s earlier projects, which won numerous awards and accreditations for its striking design. Cloudbreak also features textured and contemporary interior styling by Parisian designer,Christian Liaigre, with furnishings selected by P H. D architectural bureau. With a gross tonnage of 2200GT, Cloudbreak has the largest gt-to-length ratio of any Abeking & Rasmussen yacht at 30.34gt/m. As a result the yacht will have ample interior space for longer cruises. Cloudbreak is scheduled for delivery in May 2016 and will also be available for charter.